The Friday before dawned cool and damp. Heavy rain in the metropolitan area and some forecast for the bush, but unless you are there, it’s difficult to know how much will actually fall. We set off just before lunchtime, this time taking a packed lunch as we didn’t want to sample either the delights of fast food (ugh!!) or the local bakery in Heathcote. Traffic was a little heavier than expected for the time of day and it was bothersome to realize that we had left the keys to the shed and dome behind. Luckily we weren’t yet on the tollway, so we took the next exit and returned home to fetch the keys. A couple of projects had been planned, so we had the ladder, some pavers and a water pump loaded. First project to tackle was sorting out the gas bottle. With a decided lean on it, the regulator had started to come away from its fastening on the wall. The paver supporting it was not only a little too small but had subsided since the original installation. A larger paver had been purchased and this one was going to be re-purposed for the next project. The bullants generously donated some of their ant sand/gravel to seat the new, larger paver & in return got some food scraps later. The next project was a little larger. We had been generously gifted a tank stand by a friend, whose copper tank once graced it…..until some unfriendly passers by “liberated” it. It was the perfect size to relocate the 500litre tank next to the cottage. The tank had been installed with no room to add pipes to take the overflow away, so any excess water flowed directly onto the wall of the cottage and onto the ground. A half brick held the downpipe in place at the top of the tank. In order to move the tank, the water needed to be drained. Rather than wasting it, some was pumped into clean 20litre drums and the remainder pumped into the main concrete tank. The residual was tipped out and allowed the silt that had build up to clear from the bottom of the tank. The bottom of the tank was rounded from the weight of the water once the original wooden stand had rotted away. The redback was dispatched to its maker and the huntsman spiders scuttled off to find other accommodation. Gloves on, the rocks and bricks were carefully removed to reveal how badly rotted the timber supports were. Lifted off with a shovel and put aside they will eventually form part of the environment or be used once the firebans are lifted as small kindle for the evening fire. The tankstand was set in place and the pavers lined up. A little work to level them all out, then the empty tank was lifted up onto it, and some work done to shorten the down pipe. The overflow was placed away from the house and will have pipe plumbed in to divert the water away from the cottage. The tap was located (to the right in this photo) so as to make it easier for hand washing and shelf will be added later. A small retaining wall was built to divert the natural runoff away from the pavers and eventually garden drains will be added as part of the plans to have paved areas around the cottage. The leftover bricks were used to form a platform for the rubbish bin which is currently used to collect greywater from the kitchenette and also form part of a temporary splashback for any overflow if the tank fills. Water from the 20litre containers was pumped back into the tank to provide weight, so that any strong winds don’t catch the tank and blow it away. Another project that was underway on Saturday was the restoration of the futon mattress. 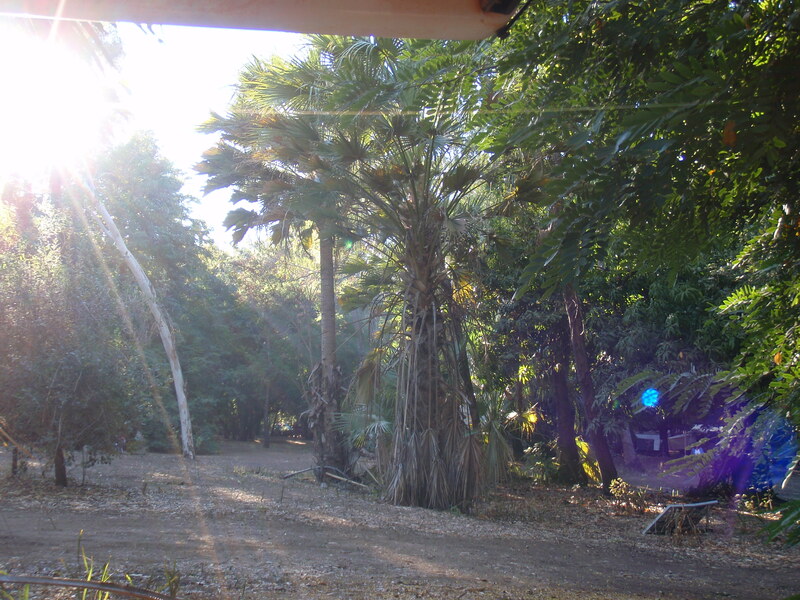 Perhaps the cleanse and a couple of days of strong UV would restore it to almost new…. Sunday’s projects were a little less obvious, but still industrious. With plenty of sunscreen on, the dirt and lichen was removed from half of the Observatory. From a distance the lichen looks like holes and can’t be good for the fibreglass. Two buckets – one of soapy water and alternating between the use of a scrubbing brush and a tea towel, the dirt was cleaned off. The other bucket was for rinsing off the grime. It was easier at times to pick/peel the lichen off once it was moistened. Heat and flies got the better of us and we retired for lunch. More projects are planned over the coming months, such as creating either a paved area around the cottage or constructing a verandah. Sunday afternoon saw the temporary placement of “pegs” to mark out the proposed area. This is something to contemplate for a while as drainage needs to be considered. Later in the afternoon, an amble down to the front boundary fence to check out what needs to be mowed, slashed or fixed. Apart from the gate posts, there are a number of posts that have rotted or been damaged by falling trees, so there is no possibility of having any animals on the property for agistment. The local kangaroos have well worn pathways where the fallen branches have flattened the fences. Again, another job to be put on hold for when we can safely use the chainsaw. 2 + 1 + 1 + 2 + 0 + 1 + 4 = 11 ….. a Master Number Day……. and what an interesting day it has been so far…. This month is a continuation of last year’s quest to simplify and a few activities that I was involved in last year have now been put aside. Just to test me, a possible new venture was put in my path and although the person was quite persuasive, it didn’t sit right. Business planning for the next 90 days is underway and a review of websites and their content is happening. Pages have been deleted and templates changed. A quick break for a cup of tea and a refill of the water bottle and back to the office……and just after I had entered the room….. an almighty crash!! Two certificates fell to the floor…… two others, above and below stayed secure on the wall. No glass broken… and another tenant came rushing out to see if I was OK.
A quick spray of space clearing essence and then some clearing work to be done as a couple of things have moved in the past week or so and my sacred bamboo has suddenly turned up its toes and terminally wilted. My timetabled study done, another break was beckoning. This time I decided to consult the cards ……Using the Rider Waite deck, the following 3 turned up. I don’t consider myself a Tarot reader to read for others, but I will turn the cards for myself. In the context of my life at present, I found it interesting that I picked up a card with a garden or agricultural background. Currently sowing the seeds of new beginnings, I will tend these seeds carefully so as to be rewarded with a good harvest. I also see this as holding the foundations of future abundance as I begin to follow my soul’s path. 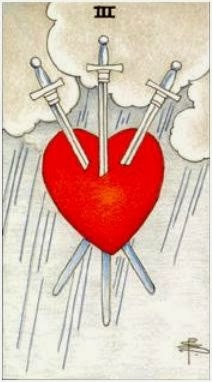 The second card I drew was the 3 of Swords. Initially when I looked at it first I saw only the Heart, then the piercing of it with the 3 swords. A validation that the ending of several draining relationships was literally, in the cards! A time of release…. and time to focus on recovery by letting go and moving on. Explains the deep sadness that has enveloped me the last couple of days…. I had to laugh to myself when the third card revealed itself…. The Fool! 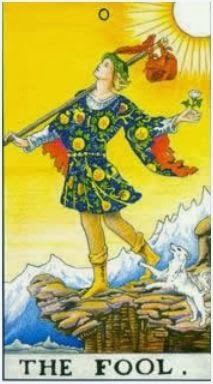 Stepping out and beginning a new journey, the challenge is to maintain balance on what seems to be a narrow path, yet maintain an equilibrium between heaven and earth. I’m always needing to be more grounded!! The small white dog seems to protect yet push the boundaries of the traveller who seems to be appreciating the beauty of the journey – sun shining and mountains in the distance. 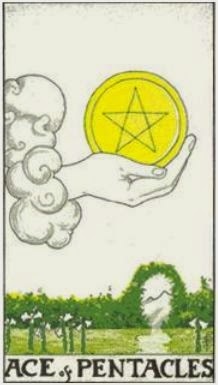 With face turned heavenward to better receive the information of the gods and yet treading lightly upon the earth, this card seems to me to be a signal to confront any fears and trust that I will take the next step safely. Only today, I noticed that the card has a zero at the top. Starting with nothing and creating the endless possibilities contained within a circle? Or “O” for optimism? A pleasant interlude and the creation of a space to share my personal interpretation of the cards. Just recently, I have re-connected with a couple of people not seen for many years and whilst there has been the occasional email or social media contact, it really isn’t the same as chatting easily over a cup of tea or coffee. One meeting triggered an examination of my personal journey over the last few years. A reflection, perhaps triggered by the review and planning process of the New Year. “Are you still doing your Energy work? Immediately I replied with a “Yes”, but in that moment realized that although I have a daily Meditation and Reiki practice – often sending absent Reiki to friends and colleagues, I have let much of the spiritual work in maintaining Mastery slide. An audit of what studies I have done showed a common theme….. starting many years ago with weekly Yoga sessions, then Meditation. Life was on hold for a while as I juggled young children and going to work as a teacher, but in the first school …. a most unlikely place, I thought, I had a Lifetime person step into my life when she introduced me to Reiki. She could see I was stressed, put her hands on my shoulders sending Reiki…… It felt as if my blood had turned to lemonade…. I went all “fizzy” with the energy. 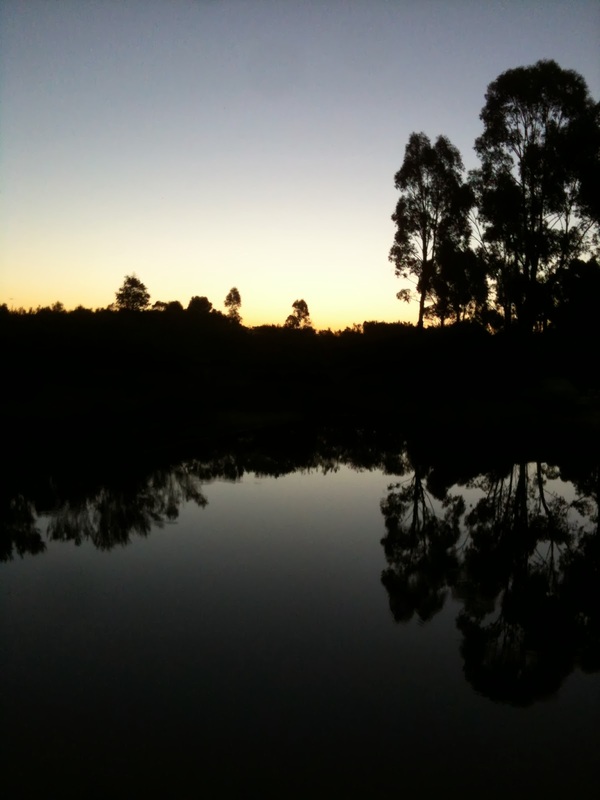 Weeks later, I found a Reiki Master and was attuned to the energy…. the start of an amazing journey. Level 1, followed by Level 2 and I resisted becoming a Master for another 9 years!! 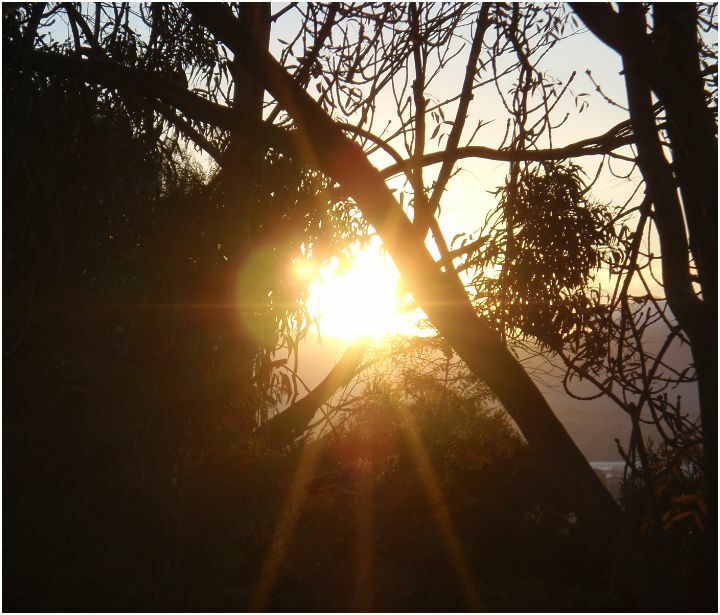 Other energy therapies beckoned in that space……. EMF (Electro Magnetic Frequency) Balancing, Homeopathy, Polarity Therapy, Touch for Health, Pranic Healing….Spiritual studies….. I find it curious how the path of life often weaves a different pattern to what we might envisage for ourselves. Yet all these studies and people who taught them have contributed to my mastery…. they have been there for a reason or a season or a lifetime. Whilst reflecting on what Mastery means, I came upon a list of some 44 attributes that a person seeking Mastery might have. A little daunting… but a good challenge for the coming weeks, months and years ahead…. I printed out the list, ready to refer to it and have decided to randomly pick an attribute to work on each week and write in my journal about the journey. Later this week I will revisit a teacher of one of the Energy therapies I studied a while back and will perhaps refresh the knowledge in this new year…. A big grass fire up near Tooleen on Boxing Day, helped us to make the decision to postpone our trip to the block in the interests of staying safe. Temperatures in the high 30’s are much more pleasant when spent around a home pool rather than a dubiously muddy dam…. With the CFA Fire Ready & VicTraffic apps downloaded, we loaded up the camper and car and set off. The journey up was incident free and took around two and a half hours including a stop (mistake) for fast food on the outskirts of Melbourne. We would have been better off, financially and healthwise had we waited for the healthier option of a salad roll at the Heathcote Bakery. Gate unlocked and we took a slightly different route in (2nd mistake) and arrived to notice a rear tyre rapidly deflating. We unpacked to lighten the car and the tyre was repaired. This trip saw us taking up a few 20 litre buckets and a newly constructed toilet pedestal for a composting toilet, as well as a small supply of solar lights and some other bits and pieces that we intended to leave up there. 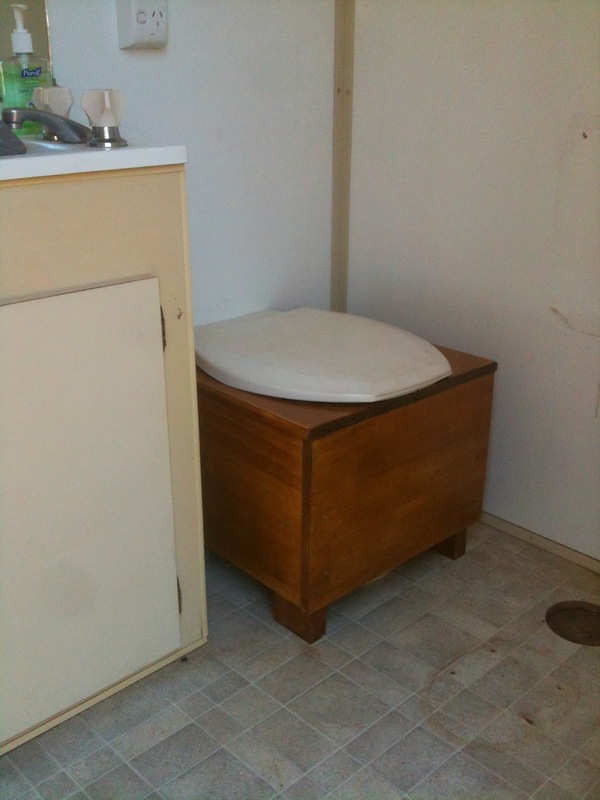 The toilet was placed in the “en suite” that sits high on the hill. No water or plumbing connected, but it has potential to have it connected as well as an external power point to plug in the power. 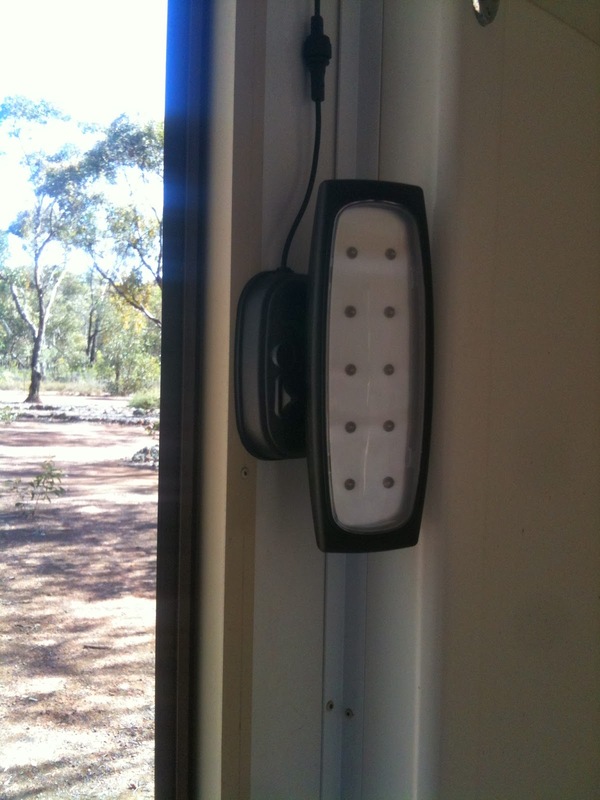 However we solved the lighting problem by installing a solar shed light that reflects into the mirror, giving lots of light. The porcelain septic pedestal was removed and the wooden pedestal placed over a bucket, which will be used for composting in about 12 months time. Another large bucket of sawdust fits into the cubicle and that is used in lieu of flushing with water. Handwashing is either with antiseptic hand wash or in a bucket of water outside, to be used later to water some of the succulent plants that are scattered around the living area. The view from the loo is quite peaceful as well, looking towards the back fence and small birds can be observed in the trees. We discovered that they like to forage for small insects and spiders in the dead mistletoe high up in the branches. On our second day, we had day visitors for lunch in the cottage. Having the futon and a card table has made a difference to our seating arrangements and we decided against eating in the shed as it warms up quickly. No doubt it will be chilly in there in winter. The paddock bomb was fired up and taken for a drive, needing one rescue by the Patrol when the battery died…. It got going again and the visitors were taken for a tour of the boundary fences…. 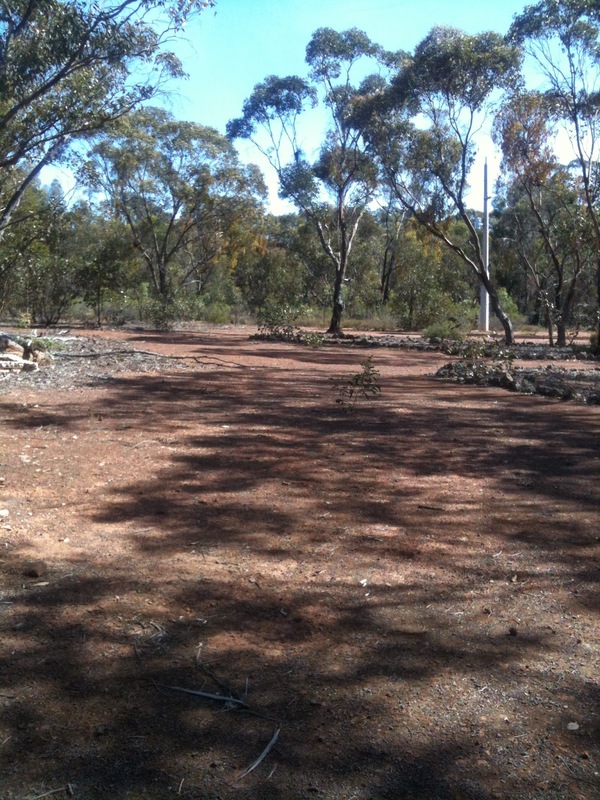 doing a bit of bush bashing through the scrub that needs to be slashed. Another visitor for dinner that night, our good friend Peter, who has built a mudbrick cottage some 16kms away. (It is on his property that I have built the labyrinths). Good wine, good conversation and and agreement to celebrate New Year’s Eve in a similar fashion….. The morning chores done, I sat down to do a little crochet, a little reading…..
Peter arrived late afternoon and we strolled down to the top dam. The kangaroos didn’t seem too perturbed by our presence and allowed us to get within about 20 metres before hopping off. The temperature was somewhat cooler down by the dam and we wandered down to the lower dam to watch the sun go down. Realizing that it was after 9pm, we strolled back up to the cottage and sat outside with fruit and wine to observe the stars. I’m thinking that my next purchase for the block will be some banana lounges so that our necks don’t get cricked looking up at the Milky Way. Satellites crisscrossed the skies at regular intervals, some traversing North/South, some the other way and others travelling West to East. Suddenly we realized it was approaching the magic hour when the year ticks over to the next…..
….and there it was….. a new year, with a new moon on New Year’s Day. What a great start …..! !